A Bit of Sass: It's the Weekend. 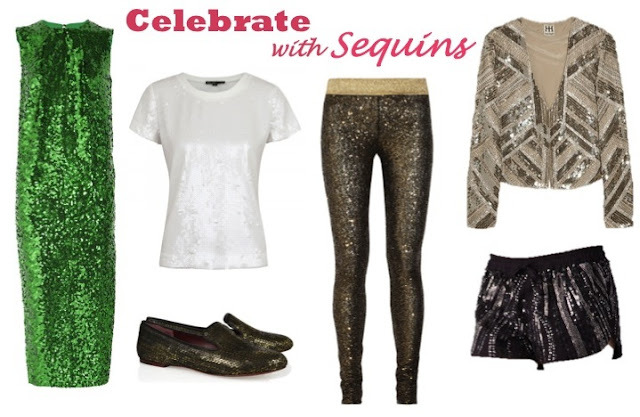 Celebrate with Sequins!! It's the Weekend. Celebrate with Sequins!! Well, it's the weekend!! Break out your sparkle and celebrate with sequins. If you've been reading for long you've probably noticed that I'm more rock-chic than girly-glam, so I've done my homework and found sequin numbers that say PARTY rather than precious. Sequin leggings anyone?? Oh yes! I am loving all of these sequins!! Came across your blog and I love it! These pieces are adorable! Would love to follow each other on here and on bloglovin! I love sequins! Beautiful blog! This is a really cool selection, that green dress is amazing. Love the sequins jacket and short. Great pieces for going out with friends at summer night! I love sequins! They are so stylish! Tha pants are amazing! I've always wanted an all sequin, black dress. :P I feel like it's such a versatile piece. Gold sequins are a bit extreme though, at least for me! I love the sequins, perfect weekend inspiration! Darling blog, happy I came across it! Have a great week!! That's a cool collection! This pink sequin dress looks so pretty! Would you like to follow each others blog on GFC? Love sequins! I make sequin earrings and other shiny things! Sequins are such a good accessory for a night out on the town. i have a great 1970s butterfly sequin top that looks great with skinny jeans. I'm kind of crushing on the sequin loafers you posted too. Hope your weekend was fun and sequin-filled! You are so absolutely right. thanks for visiting my blog chelsea! I have to show my sister this post..she is sequined obsessed. We all tell her she needs a support group! Oh that is really nice. Such a cool collection of pictures. We like! OMG that green sequin dress is my new best friend. Love it. Sequins are my fav! My latest post shows how I wore them casually. I began following you on GFC, Bloglovin pinterest,twitter. WOold love for you to follow me back!